Written by Christopher Shea, Columbia World Projects. It was originally published January 2, 2019 on Columbia World Project’s website. Sarah Johnson with farmers in Bangladesh. Photo credit: Mesbahul Haque. “I will never forget those voices and those faces sitting in front of me,” Sarah Johnson, a student at Columbia’s School of International and Public Affairs (SIPA), said over coffee at a campus café recently, as she described a meeting she had with a group of elderly rice farmers in the Charlands of western Bangladesh this past summer. 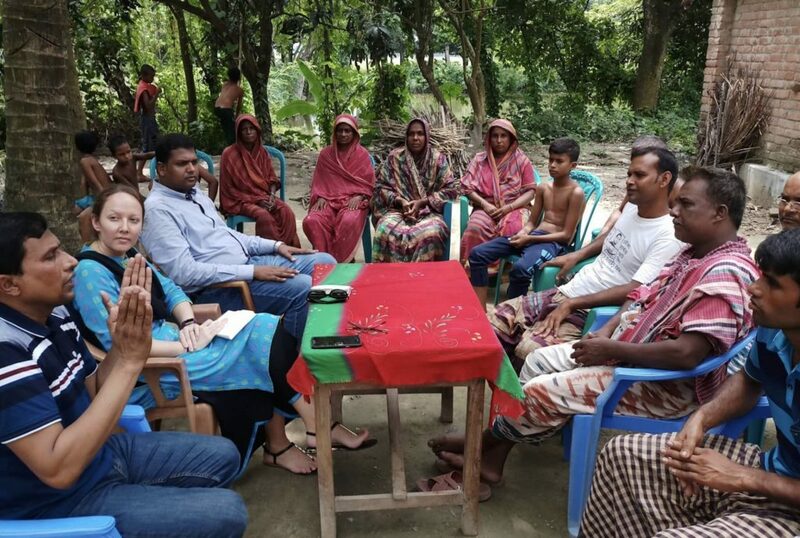 Johnson made the trip to western Bangladesh to learn how to transmit relevant climate information to farmers, like the ones she met, with the goal of helping them improve their crop yield. Methods such as text message alerts are being tested by international organizations like the World Bank to try to reach remote agricultural workers to help them head off dangerous weather and take advantage of good growing conditions. During her time in Bangladesh, Johnson headed west from the capital of Dhaka to find out if the communications methods are working. Johnson, who is set to graduate from SIPA in the spring, was in Bangladesh as part of ACToday, the first project launched by Columbia World Projects. This new initiative aims to develop projects that brings the University’s research and scholarship to bear, in partnership with practitioners, in order to affect people’s lives positively around the world. 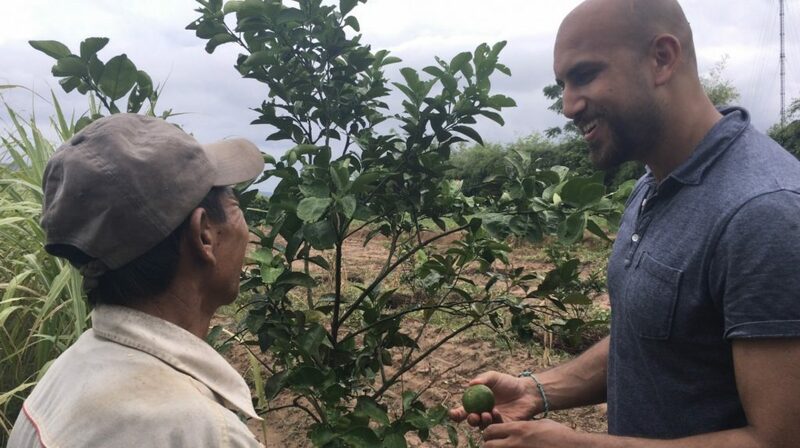 As part of ACToday, climate scientists from Columbia’s International Research Institute for Climate and Society (IRI) are working with students like Johnson to ensure that climate information that can bolster crop yields makes it from meteorologists to the agricultural workers who need it on the ground. Bangladesh is one of the six countries in which ACToday operates. The others are Colombia, Ethiopia, Guatemala, Senegal and Vietnam. This past summer, 14 students from the SIPA Master of Public Administration in Development Practice program joined ACToday’s partners in the field for summer placements. During their time there, students focused on identifying the stakeholders and structures that govern each country’s agricultural supply chains. With that knowledge in hand, IRI will work toward its goal of establishing structures to get more information into the hands of agricultural workers who could most benefit from it. In interviews, SIPA students described experiences as eye-opening and varied as the countries they visited. Nausher Khan worked as a television journalist and talk show host in his native Pakistan before enrolling in SIPA in 2017. He hopes in several years to return home and open a nonprofit that will improve access to food in underserved public schools. Mr. Khan spent the summer in Vietnam, where, in addition to developing his stakeholder analysis for IRI, he shot video footage for a digital case study about climate issues in the region. Nausher Khan in Vietnam. Credit: Nausher Khan/Claire Thibault. Khan prepared for his Vietnam trip by taking a class that focused on the rice value chain in Vietnam. But it wasn’t until he got to the country that he learned how much power the country’s farmers’ union wielded. “There is always a difference between what you see on paper and what you see in daily life,” he said: “Vietnam was no exception.” In the report that he and his SIPA summer partner produced for IRI, they stressed the importance of working with the union if they wanted to reach the broadest swath of farmers across society. Kristine Kim, who worked for a decade in the fashion and legal industries before enrolling at SIPA, spent her summer in Colombia, and focused on learning about the powerful players in the country’s coffee economy. “A lot of these soft power dynamics aren’t explicitly publicized,” she said, explaining the importance of developing stakeholder analyses to figure out who holds power within a given agricultural system. She said that after doing extensive research before her trip, she had to improvise somewhat on arrival, “taking as many meetings as we could, networking as much as we could, having interviews to understand who controls what and why.” In her final report, she and her SIPA summer partner detailed the operations of Cenicafé, a research center that operates on behalf of the country’s largest coffee producers, and that collects some of the country’s most advanced meteorological data. Cooperation with Cenicafé would be crucial for a long-term climate strategy in the country, she and her partner argued in their final report. In Bangladesh, Johnson spent much of her time in Dhaka, where she helped with the logistics of the launch of the Bangladesh Academy for Climate Services. The new academy, which was launched by four founding partners, including ACToday, is focused on getting the latest climate data, and the tools to use it, to a broader swath of professionals working across various sectors in Bangladesh. The most surprising discovery from her conversation with the farmers in the Charlands, she said, was that they simply wouldn’t take notice of text messages. Some couldn’t read, and others said they would simply prefer to see the information posted somewhere public so that they could discuss it and strategize with others.